I’d guess she joined the train at the start of the line, Brighton, a coastal town about 50 miles south of London. By the time it reached East Croydon, a commuter gateway 10 miles out from the capital, her stuff was everywhere. The shared table in front of her was covered in an empty sandwich packet, water bottle, her glasses, a Toshiba laptop and an iPad, propped up in a leather case. Curiously, her phone was nowhere to be seen. She’d hung her red suit jacket on the coat peg alongside her seat, but seemed otherwise oblivious to the fact people were now standing in the aisles, while she occupied all of a table intended for four people, and two seats. It was only when those standing beside her raised the volume of their polite British murmurings to something which might be considered muttering that she looked up in surprise from her two computers. “Oh, I’m so sorry!” Hurriedly she started stuffing the sandwich wrappers down the side of her seat, gathering her files into her large handbag and trying to make room for someone to use the seat. I’d guess she was late 30s, dressed for a business engagement she’d deemed important enough to tie a silk scarf at her neck. “I’ve been concentrating so hard, I had no idea!” She exclaimed, as those standing in the aisle deferred to each other in an outstanding display of Britishness. Everyone insisted that the person next to them take the seat first, until eventually a teenage boy sat down. She had indeed been totally engrossed in her two screens. The laptop – one of those bulky Toshiba models people only use because their IT department insists – was open on a Powerpoint presentation. The iPad, probably a 3 or 4 and still running iOS 6, was standing up in portrait orientation in the folding case. Oblivious to the train around her, she’d been painstakingly copying text from the laptop to a business plan application on the iPad. She’d glance at the laptop screen, then look over to the iPad and, using a single fingertip, tap out the text on the virtual keyboard. Here were two inherently connected devices, right next to each other, yet – for whatever reason – she was copying text by hand. Perhaps neither device had a cellular connection? Perhaps she didn’t know the iPad or her phone could serve as a mobile hotspot? Perhaps she did, but had chosen not to buy that ‘add-on’ plan from her operator? Digital, connectable and yet, in this instance, so obviously disconnected. It was excruciating to watch, yet – to her – those two screens were her entire world for the duration of that journey. “Have we reached London yet?” She asked the person next to her, a note of panic in her voice. It is curious to consider what was so important or engaging on her two screens that she’d have risked missing her stop? Also, it highlighted the difference in digital behaviour among those who ‘settle in’ for a longer journey on trains, versus those who are commuting on shorter segments. 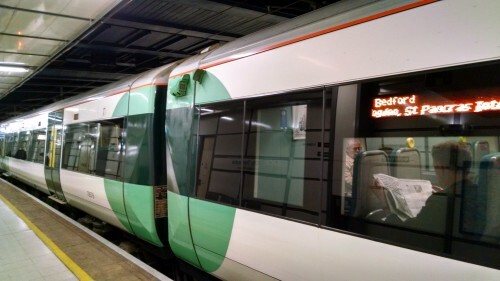 The trains that start south of London, run through the capital and onwards to the northern suburbs provide a good environment to observe these behaviours, because some people could be sitting for nearly two hours, while others join for just 15 minutes or so. Often, the most noticeable difference between these two groups is whether they swipe quickly at their phone, or whether they settle down with a laptop or tablet. There is, of course, an attraction to the seats with the big shared tables among passengers who are going to be on-board for longer periods. There’s also an unspoken etiquette about how much of the table top each of the four passengers seated around them should occupy with their computers, books and paperwork. This particular lady had breached this etiquette, but the other passengers were either too polite to say anything, or knew they were going to be on the train for a short enough time that it didn’t bother them. On my own train journeys into London, operated by a different train company, the shared tables are smaller, accommodating only a single laptop or iPad. In theory, they are there to serve four seats, but in practice the table top territory is usually occupied by the first person to sit down in one of the two window seats. However, from autumn onwards, this comes with a penalty: heat! For reasons unknown, this particular train company blasts hot air from heaters located under the window seats, regardless of whether the outside temperature is 20c or 0c. It is no exaggeration to say I’ve seen people physically ill as a result of the heat – indeed, it seems to be one of the few things guaranteed to raise a mutual grumble out of normally silent British commuters. There is another trade-off to consider though. Some people believe sitting next to the window provides more reliable cellular reception than being in the aisle seats. You see them holding their mobile devices up to the glass in the hope of better signal. The choice is yours: unbearable heat, a table and access to precious radio waves or balancing your device on your knee in the aisle seats, hoping you’ll have reception!